On 26 October, 2010 in the Banyule and Nillumbik Weekly (1) there was an article about how kangaroos in Plenty Gorge in Greensborough, the North-Eastern suburbs in Melbourne are becoming a problem. “Kangaroos can cause serious damage to farm fences and crops, scare domestic livestock, such as cows and sheep, and cause motor vehicle accidents. Controlling numbers is essential for safety and productivity. ‘‘Kangaroos can also cause environmental damage, especially if they are confined on reserved land and their numbers are allowed to increase unchecked. Contraceptives may be useful for controlling kangaroo populations in confined areas or in the peri-urban area. However, much more work is required, including an assessment of their biological and ecological impacts, before they could be considered,’’ the centre’s latest report states." What on earth is the Invasive Animals Co-operative Research Centre doing commenting on a non-invasive animal? Kangaroos are native animals and by definition are NOT invasive, exotic or feral. Why did this newspaper choose to quote from this organization and not the Department of Environment? Invasive species are organisms (usually transported by humans) which successfully establish themselves in, and then overcome, otherwise intact, pre-existing native ecosystems. According to Dept Env website, kangaroos are not invasive species either. 2. Destruction to the Environment? It is well known that cows and sheep, being hoofed, cause massive soil erosion and destruction of soil ecosystems, pollute the air, soil, waterways, contribute to deforestation and biodiversity loss and the drought. In short they are turning this country into a desert. So why are kangaroos being scapegoated for causing environmental damage when it is not the truth? If kangaroos cause damage to fences, isn’t it time farmers erected ‘kangaroo-proof fencing’ so that kangaroos do not enter farms and do not get entangled in barbed wire fences. What about the damage fences cause kangaroos, does it ever occur to them that fences are a worse hazard to kangaroos than kangaroos to fences? And what about the fact that livestock routinely damage fences? Should we cull livestock because they damage their own fences? It is a proven fact that kangaroos do not eat crops (8). Graziers will normally budget 10 litres of water per day for sheep which doubles in hot dry summers. An average size kangaroo of say 25kg only needs only 1 litre of water per day to survive. (Hume 1999). According to the CSIRO, kangaroos do not compete with sheep (3). As for scaring livestock, it’s more likely that kangaroos would be scared by livestock. Kangaroos do not attack cows and sheep - they are herbivores after all. 6. Causing Motor Vehicle Accidents? It would be fair to say that humans cause motor accidents as equally as kangaroos. We are in their territory after all. In many ways we could prevent these motor accidents. a)	Why aren’t there overpasses or underpasses for wildlife on main roads? b)	Why aren’t there wildlife corridors for kangaroos to traverse to their habitat which we continually carve up as if the land is ours, not theirs? Surely we are the ones to blame for not accommodating them and their needs? c)	Why don’t more motorists slow down when they see kangaroos by the roadside, especially at dusk and dawn? d)	Why don’t more cars have shoo-roo devices attached to them emitting a high-pitched noise to alert the kangaroo of the approach of their vehicle? Aren’t we equally responsible for all the motor vehicle accidents involving kangaroos? How many kangaroos and other animals die every day and suffer in agony compared to the number of humans losing their life as a result of these accidents? Aren’t we being a trifle selfish (anthropocentric) here? The Invasive Animals Co-operative Research Centre says it’s important to control kangaroo numbers. Well isn’t it time we controlled our own populations? Human overpopulation at 7 billion is certainly overdue for a bit of controlling! What a joke that we should be controlling a native species (and white man is feral to Australia remember) when we can’t even control our own. Perhaps compulsory contraception of humans would be a good start? Yet the Department of Sustainability and the Environment (DSE) issues permits for landowners to ‘cull’ kangaroos on their property. Obviously we live in a society where it is permissible to kill ‘protected’ native animals when people are unwilling to find other win-win solutions to a perceived threat. 8. Threat to Communities or Public Health? I have never heard of kangaroos attacking people unless they were walking a dog off the leash. That is understandable as those kangaroos were most likely only trying to protect their mob. If people would have their dogs on a leash at all times, including on their properties, such a situation would never arise. Herbivores are not aggressive unless there is a life-threatening situation. As for public health, eating kangaroo meat (such as what is for sale in supermarkets around Australia) would be far more of a public health risk than having them hop around outside. It’s a joke that DSE can talk about public health in this way when kangaroo meat, being game meat, is full of parasites and zoonotic diseases (4). 9. Is it Humane to Kill a Healthy Animal? According to DSE a condition of a permit is that humane methods of destruction are used. However, we know that this is not always the case. Not all landowners are skilled in the use of firearms and many kangaroos will not be humanely shot in the head. Anyone can get a gun and a permit without the ability to hit a target. Wildlife carers have to attend to animals with faces blown off, limbs missing, orphaned joeys. Yet DSE does not regard relocation as an option, which seems infinitely more humane to me. Given a choice between death and a new place to live, what would you choose? Is killing a perfectly healthy animal because it’s in our way humane? Or is there a better solution? In view of the above points, how can anyone refer to kangaroos as a pest? A pest is an animal that causes significant damage to a valued resource. The pest status of an animal can change with time, between areas or according to the perception of the assessor. What might be one persons pest might be another’s valued resource. Native animals such as kangaroos and possums can be a pest in some situations. By that definition, humans are pests because we cause significant damage to the most valued resource of all – our environment. We have destroyed 75% of our forests. Billions of native animals have died in the process. We have polluted waterways and sucked them dry, blasting all the fish out of the water. We have ignored the unique biological and ecological role our native animals have to play in their NATURAL environment, which we are taking from them. To native animals we, with our bulldozers, concrete, trucks and cars, would be the biggest pest of all, worse than hoardes of dingoes, pythons, feral dogs and cats, poisonous toads, predatorial eagles put together. In fact WE are the nightmare to them! They flee from us on sight and no wonder. It is important to note that people decide whether an animal is a pest. What is one person's pest may be a valuable resource to another. For example, recreational hunters and meat processors may regard the feral pig as a valued resource rather than a pest. Others believe that feral pigs are a threat to the environment and agriculture. Such diversity of opinion is one of the main reasons that pest control has had varying success. How convenient… for humans that is! What is a feral animal? Strictly a feral animal is a non-native animal that has escaped from captivity and established a self-sustaining population independent of humans. Hence wild horses, pigs and cats are feral, while foxes and rabbits are not as these latter two animals were deliberately released to establish wild populations. However, the word is now generally applied to any non-native animal that causes serious damage to human interests, and is how the word is used in this web site. Man has encroached native, endemic species' natural habitat, it would make more sense to refer to us as the 'ferals' in this scenario! Does that mean we should be culled, since we are a non native species infiltrating an area outside our natural range? An exotic animal is an animal that is outside its natural range. It may be an animal that has been introduced to Australia or New Zealand from another country, or it may be an animal that has been translocated to another part of Australia or New Zealand. For example kookaburras have been introduced to south-west Western Australia. Since kangaroos are on our national emblem and proudly displayed by Australian companies, airlines, rugby teams etc. and since we regard kangaroos as pests, how does that auger for our overseas images? Guess it affirms that we are a PEST WORSHIPPING nation? AT ONE POINT THIS WEBSITE CLASSIFIED KANGAROOS AS 'FERAL' UNTIL THEY WERE INUNDATED WITH LETTERS! AFTERWARDS, ALL REFERENCES TO KANGAROOS BEING FERAL WERE REMOVED BUT THEY WERE STILL LISTED AS PESTS ON THE WWW.FERAL.ORG.AU WEBSITE. WHY ARE THEY THERE AT ALL WE ASK? Since we classify kangaroos as ‘pests’, all those logos we use to flog things to other countries and to promote our country with our Coat of Arms, must by interpretation declare that our goods and our image is, indeed, a pest. It is one thing to use something for largesse, another to appreciate its true worth. Time for some reassessment methinks. It is outrageous that government websites such as www.feral.org.au should list kangaroos and possums native to Australia at all let alone as pests. Referring to native animals as ‘pests’ is what drives local and complete extinctions, as any scientist well knows. Certainly it is more and more recognised by landowners and by ecologists and wildlife experts that the larger macropods such as Eastern Grey and Red kangaroos are disappearing from the landscape except in few pockets where their habitat and landowners allow them to exist. Even the commercial 'culling' program in NSW lists densities of the 'common' Eastern Grey that are in fact scientifically quasi-extinct (5). 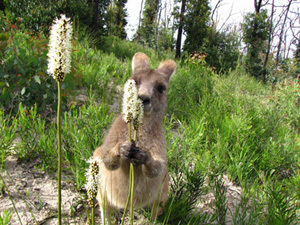 The shooting of 15% of this species is unsustainable when consideration is given to actual kangaroo population biology. Shooters do not limit themselves to shooting 15% of a local population. Local populations and mobs are in fact shot in entirety with the 15% quota only being applied as a whole to the state itself. This is why shooters are not meeting their quotas – as the populations do not exist. This is also why, in rural and regional areas, whole landscapes are being emptied of kangaroos - as ecologists doing field work in central and western NSW are noticing. Certainly the National Parks and Wildlife Service in NSW does not check landowners’ claims of hundreds of kangaroos needing to be shot under occupier licenses. Rangers have in fact explicitly admitted that they don’t ask questions as the issuing of licenses are a ‘public relations exercise’. There is in fact no central collation of the numbers of kangaroos that are shot under s.121 licences in NSW. This means no baseline data or any idea of the numbers of kangaroos shot outside the newer commercial culling program has thus ever existed. Further, the Kangaroo Management Program itself does not assert that commercial shooting is to protect the landscape from damage. It is a program driven by the kangaroo industry. If you check and analyse the official surveyed population numbers and actual reports on government websites (6), you will see their numbers have plummeted between 40-80% across regions since 2001. As a whole, populations have crashed by an average of 50% across the state since 2001 – despite correction factors multiplying actual counts by higher numbers and despite population figures including whole new counted areas in the 2009 census. The Australian Bureau of Agricultural and Resource Economics - Bureau of Rural Sciences (ABARE-BRS, formally BRS) administers the Australian Pest Animal Research Program (APARP) which engages in pest animal management issues. It is through this program that ABARE-BRS supported the development of the website feral.org.au. ABARE says that native animals such as kangaroos and possums can be a pest in some situations as they cause significant damage to valued resources such as the environment or agriculture (e.g. possums in New Zealand). But that does not mean that native animals should be referred to on a feral animal website! I utterly condemn the inclusion of native animals on a website about ‘pest’ animals, paid for by taxpayers’ dollars, using information that has not been tested or critiqued by independent sources. Since Australia has the worst reputation in the world for mammal extinctions especially in the last 230 years, surely it means humans are the biggest pest to biodiversity as well as the environment in every aspect? It's well and truly time we Australians stopped treating our native animals like vermin and learned to respect our national icon, at least as much as overseas visitors do. Premier Keneally (7) has acknowledged that our iconic kangaroos and koalas hold the key to a revival of tourism in Australia. So why don't the laws change to give them the protection they and their habitat so desperately needs? I only hope she is serious and not saying it because Oprah Winfrey (who hails from her country of birth) happens to be touring here right now? Any indication that kangaroos were a problem to the Aborigines? I mean where do humans in this society get off? With globalisation and the "one world" agenda of our governments, kangaroos are a visible reminder of our heritage, of our uniqueness, of our open plains, our Indigenous history, and our Colonial past. They belong to folklore, and should be only in pages of natural history books, not in the wild. Due to the push towards mass immigration, Internationalism and globalisation, our government doesn't want our British or Aboriginal past. It is to be wiped out so that we are a generic international resource. Kangaroos don't belong any more, have no economic value except to attract tourists to nature parks and zoos, and they only have to be in symbolic quantities and in symbolic form. Kangaroos, at least some varieties, haven't had the common decency to die off like many other other species! They are barrier to land development, and the spread of further human settlements in regional areas. Their robustness is therefore a threat, one that must be "managed" like damage control. Few people love Australia, and we are not even encouraged to any more for fear of being "racist". What a great post Bandicoot..If I hear one more Australian say kangaroos are in plague numbers and are pests Iam going to totally lose it.....This Government doesnt care about tourism. All they care about is resources and agriculture big bucks for the greedy Drones....Where I live near Margaret River WA...there is a terrible bush fly problem that occurs during the summer and it is driving the tourists away in droves. Apparently the federal government can introduce a species of dung beetle that comes out in spring which should reduce this problem but they have more or less said it doesnt damage agriculture in any way so dont worry about it. Never mind tourism...They are hell bent on mining the margaret river area aswell but being a tourist / wine region there is alot of uproar...What a coincidence do nothing about the fly problem, destroy tourism because of it and open the area up for mining , more money in the misers coffers....I love conspiracy theories..